In the latest science blog for England’s North East ALBERT SIMPSON explains how electricity works. Man’s discovery and ability to utilise the natural phenomena of electricity has perhaps changed the world like no other. From its beginnings, bringing daylight to the darkness of night, right through to its facilitation of the modern digital age, there is certainly no denying electricity’s importance. As far as North East England is concerned few regions have played such an important part in the development of electricity as a resource to serve man and this was particularly the case in the pioneering developments of electric light during the nineteenth century. 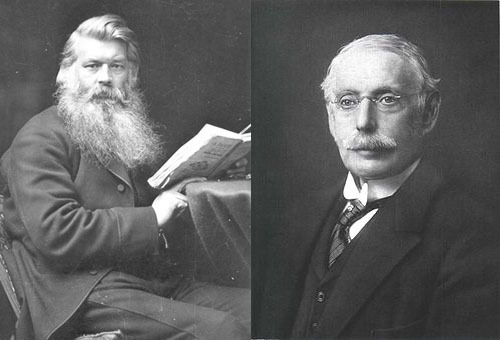 The region saw the invention of the world’s first electric light bulb by Sunderland’s Joseph Swan (1828-1914), whose later Gateshead home was the first to be wired for electric light. Further north Cragside in Northumberland was the first house in the world to be lit by electricity generated from water power. In Newcastle, Moseley Street was the first street lit by electricity and the city’s Portland Road saw engineer J.H. Holmes manufacture the first quick break electrical switch. Despite the huge role electricity plays in our lives few understand it and it is a wide ranging subject. Usually if you open any electrical text books you are quickly thrown into an array of complex laws and mathematics. I will avoid the text book stuff and explain electricity as we most encounter it, as an energy supply channelled via wires. My previous blog something about nothing explained how over ninety nine percent of each and every atom is in fact empty space and that less than one percent is mobile particle matter: namely protons, neutrons and the much tinier electrons. It also explained how interactive push and pull forces between those highly mobile atomic particles give an atom its space, volume size and shape, and how atoms are then joined to make the solids, liquids and gases of our world. Electron particles do not like one another. Any electron moving the most miniscule of distance towards another electron will transfer energy in the form of a ‘push away’ to that electron and cause it to move. Any electron moving away from another electron will reduce the ‘push away’ on that electron encouraging the first electron to follow. 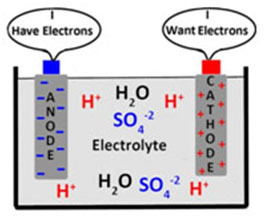 A battery (above) produces extra electrons at its negative terminal and removes electrons from the positive terminal. Consequently, electrons in a wire attached to the negative terminal are pushed away from that terminal and electrons in the positive wire are pulled toward that terminal. Push and pull forces between electrons act at the speed of light (300,000 metres a second) and electrons, being light in weight and not held too tightly by their parent atoms, respond quite quickly to those transmitted forces and move. Electrons on the move transmit changed forces to other electrons so that they in turn move and cause other electrons to move and so on. That is how energy is transmitted along wires. Some people may term the electron movements in a wire as a flow. I prefer the term electron drift to electron flow. Let’s be clear, it is not electrons whizzing around circuits that put our lights on almost instantly. It is the light speed transfer of energy via electrons to the electrons in our light bulb that does that. Amperage is just a measure of the number of electrons involved in a drift. One amp equates to 6.25 billion, billion electrons drifting across a wire cross section every single second. That is a very big number but it is only equal to the number of electrons in about one tenth of a millimetre of wire length. That is just one half of a metre every hour. 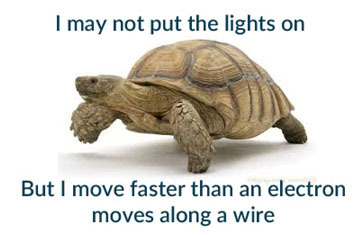 Tortoises can certainly travel much, much faster than that. Why we use copper in circuit wiring. Electrons are active in the space volumes around an atom’s nucleic centre. Scientists call such space volumes electron clouds. Each cloud can have a maximum of two electrons. Copper atoms have 29 protons, 29 electrons and 35 neutrons. The protons have little hold on outer cloud electrons so much so that some outer cloud electrons wander from atom to atom. This electron wander phenomenon is called an electron gas. Clearly the outer electrons of copper need almost no energy to move them along a circuit from atom to atom. Copper is a good conductor because there is little energy wasted in moving its electrons along a wire. Air is not a good conductor. Its atoms will in normal circumstances not release electrons in battery and mains circuits, so a switch that breaks a circuit makes for an easy way of stopping electron drift in a circuit. Tungsten was until recently much used as the element in light bulbs. Tungsten does not give up its electrons like copper does. Tungsten has higher resistance. Many copper electrons have to move and thereby push or pull to make a single tungsten electron move. When the tungsten electron moves it has much energy and when it re-engages with a new ‘atom home’ it gives up that acquired energy as radiated light and heat. When a north magnet pole moves across a wire, electrons in that wire are encouraged to move in a specific direction. When a south magnet pole moves over the same wire, electrons are encouraged to move in the opposite direction. This link between magnetism and electricity is extensively used by the rotating machines in generating stations and in wind turbines to produce our UK alternating supply or AC alternating current. In the UK supply system, an electron push followed by an electron pull repeats itself 50 times every second. Generated supply is three phase and at very high voltage. The high voltage is in fact a high electron push and allows the transmission of high energies at low amperages. This enables the use of light-weight overhead distribution cables. 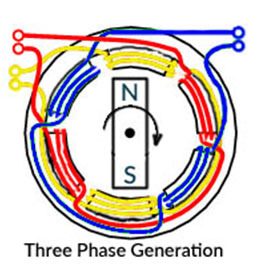 The three phases are actually three lots of similar push-pulls but they are out of sync with each other. Our homes are generally supplied with just one of these three phases and at a transformed, lower and safer 250 volts. The electron to and fro movements in the two wire (plus earth) pin plug supply of our homes is happening as a result of energy transfers between electrons (as previously described) but now over hundreds of miles and probably via several transformers. The live brown wire electrons are being pulled and pushed whilst the neutral blue wire electrons are being pushed and pulled. This is happening even when our domestic switches are turned off though the electron moves in such circumstances are so small as to not register on our energy meters. When we close a switch, in a typical home circuit, electrons move back and forth in our wiring about one thousandth of a millimetre, albeit thousands of atom distances. This shifting of electrons back and forth in a load delivers energy to that load, say an appliance, just as it did in the direct current battery circuit. The electrical load is the major energy consumer. It always resists electron movement but not always in the way the tungsten bulb did. For instance, the electrical machines in our homes that rotate all resist electron movement magnetically in a sort of reverse of the generating station action.